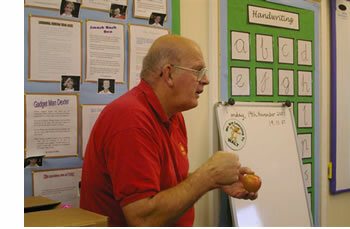 Ideally, the first point of contact is with one of our experienced deliverers visiting a school to take a lesson. This could be ‘The Farmers Lunchbox’, ‘Food Miles’, ‘Birds of Prey’ or even to install an incubator with a clutch of fertilised eggs so the class can share in the excitement of new life watching chickens incubating and hatching. Each of the lessons are designed to inform pupils about healthier eating, the impact of consumer decisions on the environment and what lives in the British countryside. All lessons are linked to the National Curriculum and are adaptable so can suit many age groups.